Measure out the 8 cups of Chex mix cereal. Pour the melted chocolate over the Chex mix. Put the powdered sugar in a zip-lock bag. Toss in the white chocolate covered Chex mix into the bag with powdered sugar. Make sure the Chex mix is fully coated in powdered sugar. 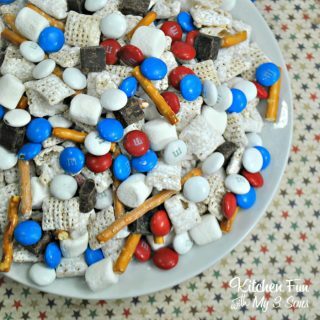 Add in the M&M’S, marshmallows, pretzels, and chocolate chunks.